Winning from Marianne Vos: Team GB is not messing around in its approach to An Post Rás na mBan. It is sending a team packed with talent; not to mention Olympic, World, European and national championships gold medals. 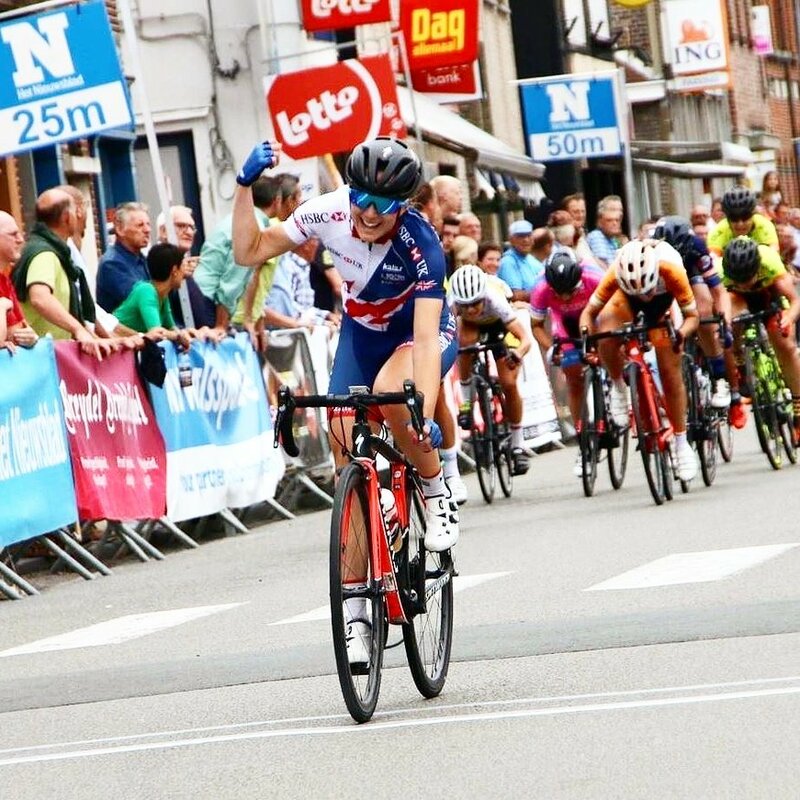 Above, Elinor Barker takes a stage of BeNe Ladies Tour in Belgium from Marianne Vos last month. Great Britain has signalled its intent for the upcoming Rás na mBan by naming a very strong team for the race, which starts next week. Elinor Barker heads the team and the 23-year-old is a top international rider on the track and road. She was part of Team GB’s team pursuit line-up at the Rio Olympics last year that won the gold medal. Barker is also the reigning points race world champion and has demonstrated her condition on the road of late. One notable road result was her 4th place in the British Road Race Championships back in June. She finished just outside the medals following a glory or bust late attack that was overhauled. Barker is also a former junior TT world champion. And she won a stage of the BeNe Ladies Tour of Belgium last month, beating Marianne Vos into 2nd place. It will be something of a family affair for her in Kilkenny next week as she is joined by her sister Megan Barker in the British team; a member of the Great Britain Olympic Senior Academy. Alice Barnes is also selected and she was 2nd overall just behind Vos at the BeNe Ladies Tour of Belgium. Barnes, whose sister Hannah was a stage winner in An Post Rás na mBan in 2013, was 6th overall in the recent OVO Energy Women’s Tour. She also recently won bronze in the European Championship U23 road race. Another young British rider to keep an eye on in the team is Mel Lowther. The 21-year-old is the reigning British U23 champion. Becky Raybould, the 2016 junior scratch race world champion, is also coming to Ireland to race for Team GB. As well as the Great Britain team, the Isle of Man is also sending a very strong line-up. It includes British U23 TT champion Anna Christian. Laura Massey and Ejay Harris, two leading members of the British road racing scene, join Christian in the team. The line-up is completed by Kathryn Priest and Tara Ferguson. Managing Team GB is Juliann Winn and in charge of the Isle of Man is former Irish international Andy Roche. Both Winn and Roche have won the men’s Rás in the past and they know Irish racing very well indeed. Facing the national selections will be trade and club teams from all over Europe and further afield. And there are also a number of regional selections from France, the Netherlands and Ireland. It will be the second successive year that the race will be based in County Kilkenny in Ireland’s Ancient East.